Begin with the video lesson option. The videos eliminate the need for training as they provide a co-teaching experience in the classroom. Each lesson will follow the same format. The first 3 lessons may seem rigorous; however, each lesson follows the same format, making them less stressful as more are taught. FTLS Introduction: The first 10 lessons take the students sentence by sentence through the introduction. Once you feel your students are ready, simply play through the introduction without pressing pause. When the introduction has been explained, have students write all 4 sentences at the same time. Each lesson is color coded to help the students focus their attention to the correct location on the lesson display as the teacher instructs. Passage books should be printed from the "tools" tab. Sources or Sources with Reasons? Sources with Reasons has been added due to some state tests wanting more structure. It includes transitional phrases (First, Next, Last) as well as topic sentences to start and end each middle paragraph. If your state, such as Florida, gives an isolated writing assessment with longer responses, this is the one to choose. When in doubt, choose Sources with Reasons. 3rd through 6th grade teachers: Under the training tab you will find student videos to enhance lesson elements. Once students have a strong understanding of the essay structure, show the videos to help increase word-choice and creativity. If teaching the lesson without the video, don’t forget to use the 2nd to last or the last button to make the document full screen. Videos will not play? Try different browsers to see what works best with your system (Chrome, Mozilla, Firefox, Safari). For Internet Explorer choose "Tools" "Compatibility View" must be checked. Go to "Compatibility View Settings", add website writebrightstation.com, and check display all websites in C.V. For Firefox users: Go to "tools", "add ons", "Plugins", and make certain java and windows presentation is enabled. 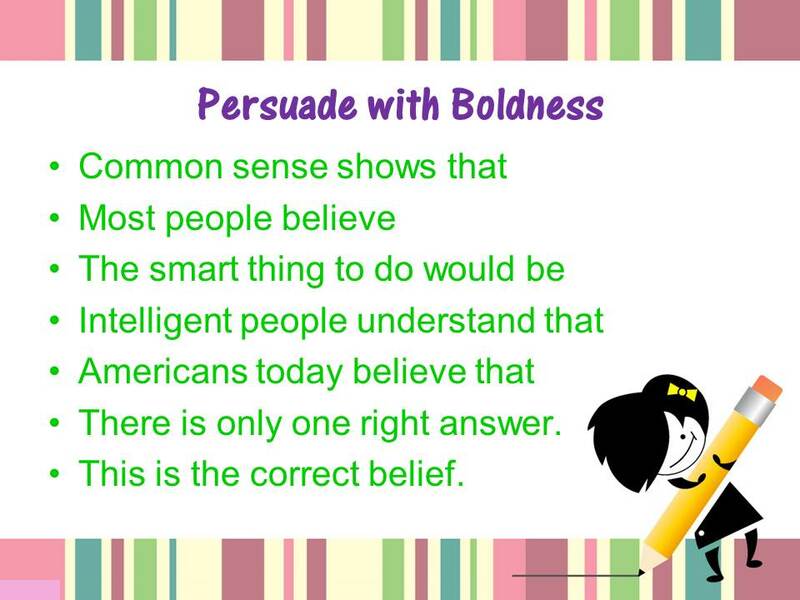 Disclaimer: Many persuasive prompts are controversial topics. The views expressed in the lessons and sample essays in no way reflect the opinions of Swaine Learning Systems or the school system, but are only models showing how to support one side of an issue.